Lisa Lucas Takes The Reins At The National Book Foundation : The Two-Way Lucas is the third executive director in the history of the foundation, which runs the National Book Awards. Her priority? Inclusivity: "Everyone is either a reader or a potential reader," she says. "It has just been an ecstatic joy to be able to do work in service of readers," Lucas tells NPR. "And it just feels like an extraordinary opportunity to build on the work they've done, and to keep figuring out ways to engage readers." 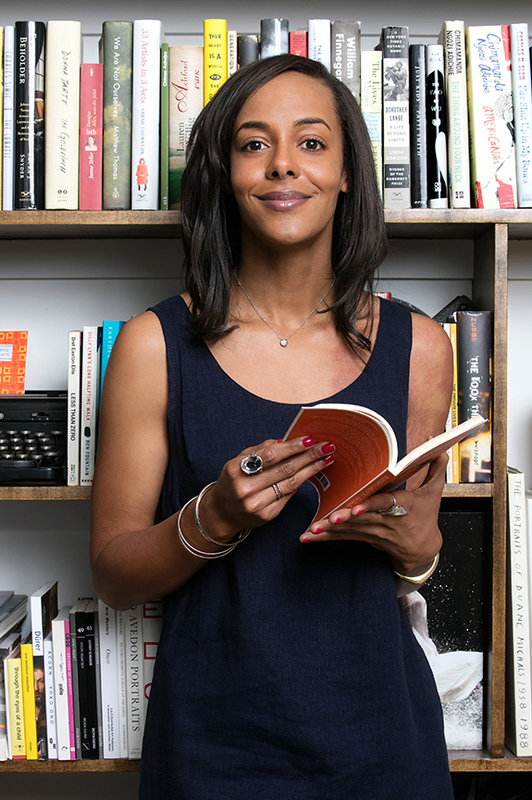 Lisa Lucas, publisher of Guernica magazine, will take over as executive director of the National Book Foundation on March 14. National Book Awards have been given out since 1950 — with a brief interlude in the '80s, when they got a makeover as The American Book Awards, in an attempt to broaden their mainstream appeal. That ill-fated experiment was ditched in 1986, the same year the National Book Foundation was established to oversee the awards. Since then, the foundation has had two executive directors: author Neil Baldwin and his successor, Harold Augenbraum, who announced his retirement last year. Lucas takes over on March 14. "How do you leverage the resources that the foundation has — the voice, the platform, the awards themselves, the relationships with readers — to reach even more audiences?" she says. "How do you take that and build a bigger core of readers who engage with the work that the foundation does?" These are the questions that will drive her, she says — and they're questions that have taken on added dimension with renewed scrutiny on diversity in the publishing industry. The #WeNeedDiverseBooks campaign, for example, drew attention to the lack of color in kids' literature, opening new programs and forcing change at the industry's annual convention, BookExpo America. Even at the 2014 National Book Awards ceremony, host Daniel Handler (aka Lemony Snicket) brought on a miniature firestorm over his racially charged jokes. He apologized quickly afterward. While Lucas, who's African-American, applauds the foundation's efforts to support diversity — in its programming, its winners and its judges — she says that this shouldn't be the whole focus. Everyone is either a reader or a potential reader. The potential audience is everyone. "The focus for me is inclusivity — and that's everyone: That's regional, that's racial, that's socioeconomic," Lucas says. "Yes, I'm a person of color, and we need to be a part of that conversation. But I think that, in the end, it needs to be about everyone actually being at the table." Ultimately, she says it's a matter of pressing forward with the gains that the foundation has already made in supporting oft-neglected voices — with programs like BookUp LGBTQ — rather than reversing its course. "It's the kind of organization that does the kind of work that I believe in," she says. "I didn't take the job because I thought I could fix it and tear it up. It's because we actually share a common cause of wanting people to read, and not really seeing that reader as a particular person." And where do you find these readers? Well, she says, they're everywhere. "Everyone is either a reader or a potential reader. The potential audience is everyone."